Catholics sometimes take their faith for granted, and it's often true that as a group, we don't study the Bible as much as other denominations. I like the opportunity to delve into something and understand the history surrounding the work, and I remember truly enjoying the New Testament classes I took while attending a Jesuit college. I have not spent as much time in the intervening years studying the Bible. 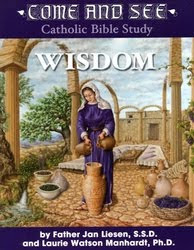 I was eager for the opportunity to review a copy of Come & See: Catholic Bible Study: Wisdom, thanks to The Catholic Company's review program. This book is an extremely thorough and comprehensive study of the Wisdom books of the Old Testament. The introduction of the book provides ideas of how to gather a group together for study, materials needed, and practical considerations. If you've never formed a study group, or even if you have, the book gives straight-forward and helpful information. Each of the 22 chapters provides a suggested social activity, steps through the reading with additional insights and relevant quotes, and finishes up with a series of study questions -- complete with space for answers directly in the book. While I would love to create a small study group around this book, I realize that the time isn't right for the commitment. I am working through the book on my own,and have learned more than I knew before and am enjoying the opportunity to study and think about the Wisdom books critically. Anyone who knows me well knows that I love to learn, so this book is a welcome addition to our home library. This review was written as part of the Catholic book Reviewer program from The Catholic Company. Visit The Catholic Company to find more information on Come and See - Wisdom - Catholic Bible Study for Adults . In exchange for a copy of the book reviewed, I have shared my honest opinion. Great review! As a Lutheran, I really enjoy Bible Studies. As a former Catholic, I think more studies not only help the members learn more about the Bible but area great way for social connections.